Volume I, and the short article published in Forge, Vol.27, No.1 (January 1998). John Richards II was born in Hartford, Connecticut in 1655, a son of John Richards I and Lydia Stocking. John Richards I had been born in 1631, a son of Thomas Richards I, probably in England. John's mother, Lydia (Stocking) Richards, was a daughter of George Stocking. John Richards I died sometime after 1712. John Richard II'S grandfather, Thomas Richards I, was probably the first of this Richards family to emigrate to America, probably from England to New England while John I was a child. Thomas I and his wife were among the original settlers granted land in Hartford, Connecticut. They had another son, Thomas II (1634-1715). Thomas Richards I died about 1637/9, shortly before the Hartford land grant was consummated. Schoolmaster Richards' Career and Family: In 1683, at age 28, John Richards II was a schoolmaster at Westfield, Massachusetts. On August 29 of that year he was elected schoolmaster at Springfield, Massachusetts. i. John III, b 26 July 1687,d l6 Mar 1748, m Jane Crane, d 1741.
ii. Abigail II, b 10 Jan 1689, Springfield, d 9 Jan 1754, m John 3 Bigelow . iii. Thomas m, b 7 Nov 1681, d 1 May 1730, m Mary ____. iv. Jemima, b ca 1694, d 1703/4 or later. In 1697 John Richards II was serving as schoolmaster at Enfield, Connecticut. The following year he was elected schoolmaster at Deerfield, Massachusetts and owned property there. He served as Tax Assessor for Deerfield in 1700/1, and as Selectman in 1702. He remained as schoolmaster at Deerfield until 29 February 1704 when an Indian massacre occurred. Indians sacked the town, burned the Richards' house, and captured their youngest daughter, Jemima, then aged 9 or 10. Jemima never returned and is presumed to have become a casualty of the Indian massacre. Within two weeks after the massacre (March 13, 1704), the Richards returned to Enfield. The following year, John sold property to his step-sons, John and Benjamin Munn, by then aged in their early twenties. By 1707, the Richards had returned to Westfield, Massachusetts. By 1709, John Richards had reclaimed and rebuilt the house at Deerfield which had been attacked by the Indians, and that year sold the property to his step-son, Benjamin Munn. Migrating from New England to New Jersey Thomas Richards II, John Richards' uncle, moved from New England to New Jersey and was one of the early settlers of Newark in 1667/8. He was one founding members of a Presbyterian church at Newark in 1668, and held the office of Deacon. Thomas Richards II married twice (his second wife was named Hannah), but had no children. About 1708, Thomas Richards named his nephew John Richards, a legatee in his will. Sometinie in the 1709-1713 period, John Richards and his family moved from New England to Newark, New Jersey to join old Uncle Thomas at his home there. Note that Richards used the term burying yard in his deed. In the 19th century, the tract was referred to as a grave yard, and in the 20th century as a cemetery. The deed which conveys the gift of land is an unusual unilateral instrument, naming no specific institution or trustees as the new owners of the donated land, nor any tangible consideration received for the property transfer. John Richards simply donated the land to the general congregation of the developing village, and encouraged his new neighbours to follow or match his major gift with their own subscriptions of support to build the church. He mentions grantees in his deed, but does not name any. The two witnesses of the deed, Jovidiah Buckingham and John Cooper, were probably among his intended recipients. Schoolmaster Richards conveyed the gift of prime land between the river and the main road to whomever might subscribe contributions to the building of a meetinghouse. Although of questionable legal correctness, the deed conveying ownership appears to have never been challenged, and the tract, with more than 300 graves, remains publically owned, 279 years later. Forty-eight burials are recorded in the old "burying yard" during the 21-year period 1893-1914 (average 2.3 per year). Ninety burials were recorded over the 36-year period 1914-1950 (average 2.5 per year). Twenty burials occurred over the 26-year period 1950-1976 (average less than one per year). The only burial since 1976, that of Leonard Thompson, occurred in 1989. The property was maintained over the 1966-1976 period by the Whippany Cemetery Association, which transferred ownership to the Township of Hanover in 1976.The original copy of Richards' deed is reported to reside in the library collection of Morristown National Historical Park. mask. It was securely embedded in a sturdy granite monument in 1914, thus ensuring its permanence. After Richards' Death A small church was erected on the tract Richards had donated in late 1718 or soon after. The building was used until 1755 when it was dismantled and the materials used to build successor churches at Parsippany and Hanover. An account of the Rev. Andrew Sherman (then Pastor ofthe First Presbyterian Church of Whippany) in 1894 places the location of the original church building just inside and eastward of the central gate on New Jersey Route 10, close to the central entrance path. However, the exact location of the building on the 31/2 acre site has not yet been verified by archeological investigation. The church building may have been the first public building of any sort in Morris County, New Jersey. No grave for John Richards' wife Abigail can be found in the cemetery today, nor was one reported in 1894 when all the tombstone inscriptions in the cemetery were transcribed and published by F. D. Halsey and W. 0. Wheeler. This suggests that Abigail probably died before her husband, John, their daughter, Abigail and their son-in-law, John 3 Bigelow, moved on to Whippany. Abigail may have died in New England before John came to New Jersey to live with Uncle Thomas at Newark, or in Newark in the period between 1709 and early 1718.
for New Jersey, and the remainder of the farm in 1729. John and Abigail Richards moved to Newark about 1715/6, and on to Whippany shortly after. County) first tax collector in 1723. Captains in the Revolution. Son Samuel 4 Bigelow was a "naval captain and privateer" during the Revolutionary War. 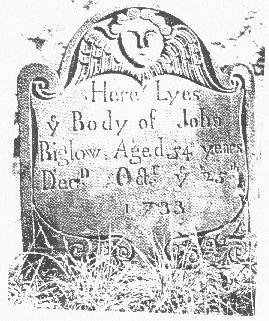 Shipwright John 3 Bigelow died 25 July 1733 at age 54, and is buried close to the grave of his father-in-law, Schoolmaster John Richards. Abigail (Richards) Bigelow, daughter of John and Abigail Richards, wife of John 3 Bigelow and pioneer resident of Whippany, died 5 January 1754 at age 63, and is buried next to her husband. John 3 Bigelow's tombstone is decorated by a magnificent cherub with a large round face - the largest and most elaborate of the cherubs or angels' images on dozens of 18th century gravestones in the cemetery. In respect of its distinction among the flock of beautiftil gravestone angels, Bigelow's gravestone has been whimsically dubbed the "Archangel of the Whippanong." The tombstone is in good condition with only slight cracking in the carved areas. It is the finest piece of early Eighteenth Century tombstone art extant in the old burying yard. A Sibling Archangel Found in Middlesex Another example of the same gravestone design has been reported in the burying ground associated with the Dutch Reformed Church at Six Mile Run in Franklin Township of Middlesex County, New Jersey, west of New Brunswick. The duplicate gravestone is for Jacob Wickof who died in 1738. The existence of this second gravestone with identical design implies that these gravestones were commercially manufactured products during the period 1733-1738.